Growing up, Paul Cimino’s mother, Wilma, had provided care for an elderly neighbor. Being raised in that atmosphere of being attentive to the needs of the elderly provided an impetus for the direction his career would later take. After an honorable discharge from the U.S. Marine Corps in 1992, Paul graduated from Pacific Union College in 1993 with a B.S. degree in Public Relations. However, throughout the period from 1988 to 1996, he also provided caregiving and maintenance support to his family’s emerging assisted living business that had started from his Mother’s help provided to a neighbor. In 1996, Paul completed nursing home administrator training with Hermitage Health Care in Santa Rosa, California. From 1996 to 1998, he was employed by Life Care Centers of America as the administrator of several large, 200-bed nursing homes and Alzheimer’s facilities in Southern California. Then from 1998 to 2001, he returned to his family’s business to serve as the administrator of Citrus Heights Terrace and Arden Park Villa in Sacramento. 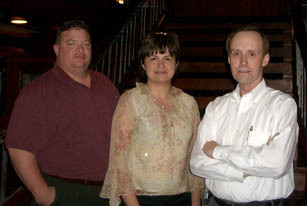 In November of 2001, Paul and his wife Sally left his family’s business to team up with Mike Williamson. Together they started The WaterLeaf at Land Park where Paul still serves as administrator. Paul and Sally have three children, Vanessa, Paul Jr., and Vienna, and currently live in the Greenhaven area of Sacramento. Paul enjoys occasional scuba diving and recently served as the president of the marching band booster club for Kennedy High School where his son played the trumpet. Sally oversees the activity program at The WaterLeaf as well as general facility operations. Mike Williamson graduated from the University of Tennessee in 1975 where he received a B.A. in Mathematics & Computer Science as well as a commission in the U.S. Air Force as a 2nd Lieutenant through the ROTC program. He then finished an M.B.A. degree at Andrews University in Michigan, and later, additional post-graduate work at Stanford University, UCLA, University of Tennessee, and University of Hawaii. From 1979 to 1986, Mike was an assistant professor in the Department of Business Administration at Pacific Union College. During the period of 1987 to 1994, he served in various roles from software project manager to associate director of computing services for Loma Linda University and Medical Center, as well as SCT Corporation in Philadelphia and University of the Pacific in Stockton. Shifting gears into the field of assisted living came in 1994. From then until 2001, Mike served as controller and operations consultant with Cimino Senior Care Management in Burlingame. And then, along with Paul and Sally Cimino, in November of 2001, started The WaterLeaf at Land Park where he still serves as CFO and is involved in general facility operations.